Local ingredients are ever more prominent on menus, from high end to mid market people want to know where their food really comes from. In the UK Simon Rogan’s L’Enclume comes to find for utilising many wild ingredients local to their beautiful Lake District location. I remember eating there and having British plants I had never heard of, anise hyssop dessert was memorable for the wrong reasons mind you. Aniseed is the work of the devil. Closer to home even Sat Bains has made the most of what nature has to offer, a nettle and horseradish dish the best you could hope for under the ring road flyover mind you. It was with this in mind that I booked a foraging experience as a Christmas present for my girlfriend. Although as she proof read this she did point out it sounded like a present for me! Anyway the day didn’t come until late May as I wanted a semblance of decent weather as we would be out and about picking our wild food. It was hosted by the well known School of Artisan Food that resides on the Welbeck Estate. I say hosted as it is run in partnership with Totally Wild UK, wild food experts. They have a small team offering courses across the UK and our expert was the main man, James Wood, who has appeared on several times on TV sharing his foraging knowledge. The event started with some refreshments and kudos to the Artisan food team as we were well catered throughout with produce that had been chiefly made on site. At around 10am we set off to learn about the wild food that could be found on the estate and how to identify it. The majority of discoveries were things that were right under our nose. I won’t share them all but one such example is the Lindon (or Lime) tree that is a common sight up and down the country. 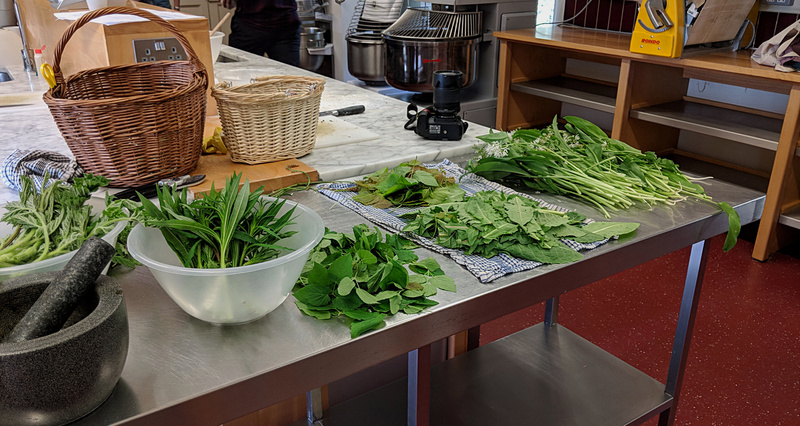 Later in the year its flowers make a popular tea but currently its young leaves can be picked for an alternative salad lettuce, one more nutritious than common alternatives. Similarly the dandelion presents a couple of opportunities, the yellow flower petals can be made into a syrup that is a vegan honey alternative, and really tastes the part! The root of the plant after drying and roasting is remarkably similar to coffee, with no caffeine of course. One of the great things was that James bought a selection of samples so we really did try and syrup and coffee substitute. 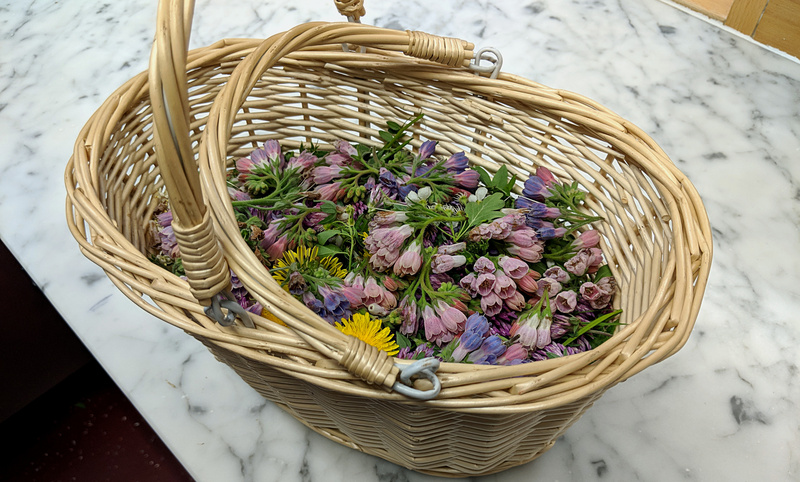 A good three hours of picking passed in a flash and we returned to the school, baskets full of fresh greenery and pretty edible flowers. The second part of the day sees you turn from gatherer to chef to cook a 3 course meal. First on the menu were nettles, tasty and versatile, if a bugger to pick. Nettles are often compared to spinach but I actually prefer the flavour, a little more salty and savoury. In this case we put together a soup with a classic base of potato and onions was that given an injection of green. Very tasty it was too. 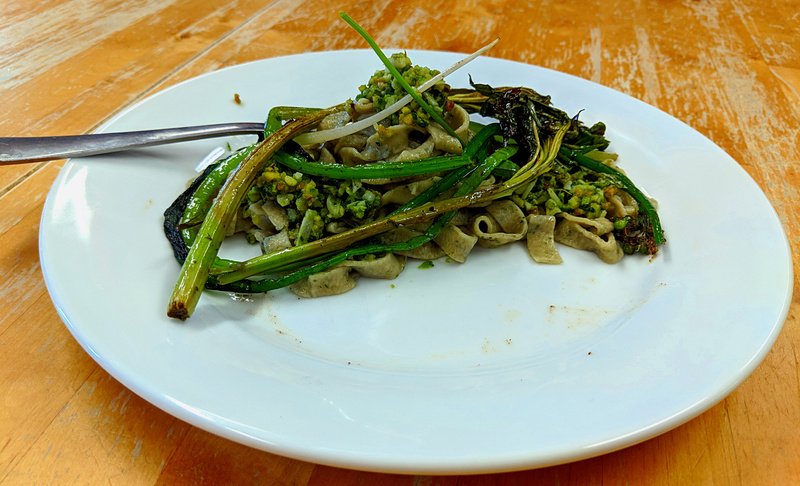 A main course was homemade pasta with nettle in the dough with a wild garlic pesto. Our job was the tagliatelle, and a I would rate our efforts good but room for improvement. Pesto was made similarly to the Italian version but nettles and hazelnuts substituted for basil and pine nuts. Atop was some fireweed and hogsweed (the stems used similarly to asparagus) that had been pan fried in more wild garlic. 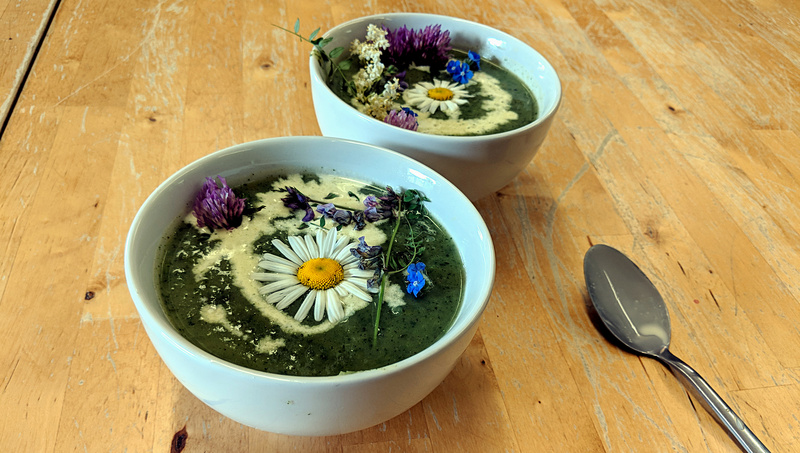 As with the soup a handful of flowers go a long way in the presentation stakes, Vetch our favourite that bought peashoot flavour to the party. Finally we made an elderflower inspired dessert, a deconstructed cheesecake was the idea. A biscuit and butter mixture was concocted to sit alongside the elderflower cream cheese. For that we used home made cordial as well as some stewed strawberries for extra fruitiness. A genuinely enjoyable and interesting day was had, there were 15 other patrons but it felt easy to get along as you have a common interest. Even if we had gone away and forgotten it all or not been bothered to get back out there it would have been great. But we were inspired! The next day we were hunting down all these new ingredients in our local area. It really is all under your nose as we found lots of them without too much trouble. There are currently jars of foragers pickle in our fridge and 25 litres of elderflower wine that needs to be bottled! A feature of wild food is not only the freshness but in general it is very nutritious. If that wasn’t enough it also gets you out and about exploring and appreciating your countryside more, something that we often don’t take the time to do. A thumbs up to the course and to the philosophy of foraged food in general.